The Johor–Singapore Causeway, (Malay: Tambak Johor) is a 1,056-metre causeway that links the city of Johor Bahru in Malaysia across the Straits of Johor to the town of Woodlands in Singapore. It serves as a road and rail link, as well as water piping into Singapore. The severed causeway on the eve of Japanese invasion in 1942. From the 19th century, Malaya's commodities such as tin, rubber, pepper and gambier were largely shipped through the port at Singapore, a British colony. These materials were trans-shipped across the Johor Straits by ferry. The early 1900s saw a rise in cross-straits traffic of both goods and passengers, and the ferry system grew increasingly congested. By 1911, the demand for the ferries was so high that they had to be operated around the clock. The volume of traffic and the high maintenance costs of the ferries led the colonial authorities to search for an alternative system. W. Eyre Kenny, the Federated Malay States’ (FMS) public works director, suggested the construction of a rubble causeway across the Johor Straits, and this proposal won favour over a bridge as the authorities considered the cost of steel and maintenance costs of a bridge prohibitive. In 1917, the British government commissioned consultant engineers Coode, Matthews, Fitzmaurice and Wilson to prepare plans for the causeway, and these plans were presented to FMS, Straits Settlements (SS) and Johor governments in 1918. The proposed Causeway would be 1.05 km long and 18.28 m wide, with metre-gauge railway tracks and a 7.92 m wide roadway. It would also include a lock channel that allowed the passage of small vessels, an electric lift-bridge, water pipelines and floodgates to manage the water flow of the straits. The total cost of the project was estimated at $17 million Straits dollars, and was shared among the FMS, Johor and Singapore governments. In June 1919, the colonial authorities awarded the contract for the Causeway's construction to Topham, Jones & Railton, a London-based engineering firm. Construction began in August, with the project considered technically challenging for its time. The Causeway was also the largest engineering venture in Malaya then. Construction started at the Johor end of the straits, where the lock channel was to be located, in order to minimise disruption to existing ferry services. The quarry on Pulau Ubin was reopened to supply rubble and crushed stone, and the granite supply was later boosted by stone from the Bukit Timah quarry. In April 1920, a ceremony was held to mark the laying of the Causeway's foundation stone. Sir Laurence Nunns Guillemard, the governor of the SS, conducted the ceremony from aboard the yacht Sea Belle, anchored in the middle of the straits. The occasion also involved the Sultan of Johor, Ibrahim II, and the mufti of Johor, who poured ceremonial waters (air doa selamat, air tolak bala and air mawar) into the straits. The ceremony was ended by the emptying of the first two loads of rubble (some 500 tons of granite) into the straits. During an economic depression between 1920 and 1922, public criticism of the project and its costs nearly led the FMS and SS governments to halt construction. The project continued however and in June 1921 the deposit of rubble began on the Johor side, which allowed construction of the Causeway's superstructure to begin from both sides. Work on the lift bridge began in August 1922 and the lock channel was completed in December. From January 1923, all shipping on the straits was diverted through the lock channel. The straits were sealed up by June 1923 and the Causeway was opened to goods trains from 17 September. The goods ferry service, which by that time was running around 11,000 trips annually, and the passenger ferry service were ended. On 1 October, the Causeway was opened for public use and the first passenger train across it arrived at the Tank Road station in Singapore at 7.41 a.m. that morning. A Causeway toll, which ran up to 40 cents for first class carriage passengers and replaced the ferry fee, was introduced. Officially completed on 11 June 1924, the Causeway's construction had involved more than 2,000 workers, local and European, over nearly five years and used around 1.14 million m3 of stone. The Causeway completed Singapore's rail connection to the mainland, and enabled the rapid rise of motor transportation between Singapore and Malaya. On 28 June 1924, the Causeway's official opening ceremony was held in Johor Bahru, and a public holiday was declared there. During the ceremony, the Malay rulers and British officials were the first to be driven across the Causeway in a convoy of 11 motorcars, after which the roadway was opened for public use. A year later, the Johor Causeway Control Committee was formed to oversee the management and maintenance of the Causeway. During the Japanese invasion of Malaya, retreating British troops set off two explosions on the Causeway on 31 January 1942. The first wrecked the lock's lift-bridge, while the second caused a 21.33 m gap in the Causeway. The pipelines carrying water to Singapore were also severed. The Japanese subsequently constructed a girder bridge over the gap before taking control of Singapore. After the return of the British, the Japanese-made girder bridge was replaced with two Bailey bridge extensions in February 1946, with the rubble of the demolished lift bridge cleared and the railway tracks re-laid. The lock channel and lift bridge were permanently closed as there was insufficient vessel traffic to justify its cost. During the Malayan Emergency of 1948-1960, a system of identity card checks was instituted for Causeway travellers. In 1949, it was estimated that more than 27,000 lorries used the Causeway each month. Within a decade, more than 30,000 people and 7,000 vehicles were estimated to cross the Causeway daily. On 22 July 1964, the Causeway was closed to travellers without police permission as part of a curfew after racial riots in Singapore. It was reopened during non-curfew hours the following day and normal traffic had resumed by 26 July. After Singapore's separation from Malaysia in August 1965, the Causeway became the border connector between the two countries. Immigration checkpoints were built on both sides, with passport controls implemented on the Singaporean side from June 1967 and from September on the Malaysian side. 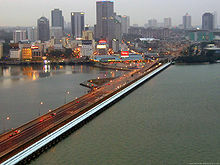 The Johor–Singapore Causeway was the first land link between Peninsular Malaysia and Singapore. The second, called the Malaysia–Singapore Second Link, was completed in 1998. The new Woodlands Checkpoint, built partially on reclaimed land, was opened in 1999 to accommodate the increasing traffic flow and the soot which had enveloped the old customs complex over the years. The old road leading to the causeway was diverted. The old customs complex, built in the early 1970s, at the junction between Woodlands Road and Woodlands Centre Road closed after the new checkpoint was opened in July 1999, although the motorcycle lane remained opened in the morning until 2001, and it had been reopened on 1 March 2008 for goods vehicles only. The new checkpoint complex also houses the Woodlands Train Checkpoint, opened on 1 August 1998, as the Singapore railway border clearance facility, which was previously co-located with Malaysian immigration and customs at Tanjong Pagar railway station. The relocation to Woodlands caused disputes between the two countries, which was resolved in 2010. On 1 July 2011, Woodlands Train Checkpoint replaced Tanjong Pagar railway station as Singapore's inter-city railway station, with co-located border clearance for both countries. Malaysian Prime Minister, Abdullah Badawi officially launched the opening of Sultan Iskandar Complex on 1 December 2008. The new customs complex went into full operation on 16 December 2008 at 12 midnight sharp, closing down the old customs complex. On 9 June 2018, Johor promises smoother journeys across the causeway. The Johor–Singapore Causeway across the Straits of Johor facing towards Singapore. The same causeway facing towards Johor Bahru. As far back as 1966, there were several calls by the Malaysians to remove the Causeway. In 1966, in the Johor state legislative council, the speaker said that the Causeway was "more a hindrance than anything else" while a port should be built close to Johor Bahru to rejuvenate the city's economy. The state of Johor currently already has developed ports including Pasir Gudang and Tanjong Pelapas. The second demand came in year 1986 when Israeli President Chaim Herzog visited Singapore. At that time, the Singapore Government was criticised by Malaysian politicians and the press for allowing his visit. Under the former Mahathir administration, the Malaysian government scheduled to build a new customs, immigration and quarantine complex on a hilltop near the Johor Bahru railway station. A bridge was planned to link the new customs complex with the city square. The project was named Southern Integrated Gateway (Gerbang Selatan Bersepadu) by the government. The project was awarded to a construction company, Gerbang Perdana. During the construction, one of the two underpass channels located at the end of the old customs complex had been blocked. Roads exiting from the old customs complex have been diverted. The design envisages a re-direction of traffic flow to the new customs complex after the completion of the proposed new bridge to Singapore. The old customs complex will be torn down once the new customs complex begins operation. All this while, no agreement had been reached with the Singapore Government on replacing the causeway with a proposed new bridge. The proposals on replacing the old causeway with a new bridge has resulted in a political rift between the two countries since the early 2000s. The Malaysian government envisioned that disagreement by Singapore to participate in the project would result in a crooked bridge above Malaysian waters with half the causeway remaining on the Singapore side. However, Singapore has hinted that it might agree to a bridge if its air force is allowed to use part of Johor's airspace. Malaysia refused the offer and negotiation is said to be still ongoing. In January 2006, Malaysia unilaterally announced that it is going ahead to build the new bridge on the Malaysian side, now referred to as scenic bridge. The construction of the new scenic bridge on Malaysian side officially began on 10 March 2006, when the piling works of this bridge was completed, but on 12 April 2006, construction was halted and scrapped by Mahathir's successor, Abdullah Ahmad Badawi, with growing complications in both negotiation (the conditions set by Singapore were strongly opposed by the people of Malaysia on grounds of national sovereignty) and legal matters with Singapore. Most recently, Badawi has said that "in [the] future, there won't be just one or two bridges between Malaysia and Singapore." In early November 2006, the Sultan of Johor called for the demolition of the link, reasoning that the Causeway is undermining the state economy. ^ Page 21. A Souvernir Commemorating The Diamond Jubilee of His Highness the Sultan of Johore (1885-1955), 1955. ^ Chua, Lee Hoong (18 October 1997). "A case of blackmail?". The Straits Times. Retrieved 21 March 2019 – via Singapore Window. ^ "M'sia Stops Construction Of Bridge To Replace Johor Causeway". Prime Minister's Office, Malaysia. 12 April 2006. Archived from the original on 25 August 2007. ^ "'Singapore". The Edge Malaysia. 11 September 2006. ^ "Malaysian sultan calls for scrapping of causeway to Singapore". Agence France-Pesse via The Nation. 3 November 2006. Archived from the original on 29 September 2007. ^ "Malaysian sultan calls for scrapping of causeway to Singapore". Bernama. 5 November 2006. ^ "Vehicle Entry Permit (VEP) Fees & Toll Charges". Land Transport Authority of Singapore. Retrieved 19 August 2014. New Ten VEP-Free Days Scheme And Shorter VEP Operating Hours, news release, Land Transport Authority, Singapore, 15 May 2005. Wikimedia Commons has media related to Johor-Singapore Causeway. Google Maps link showing the Causeway, with Johor Bahru at top and Singapore below. The Malaysia–Singapore boundary is located where the road surface changes colour midway.